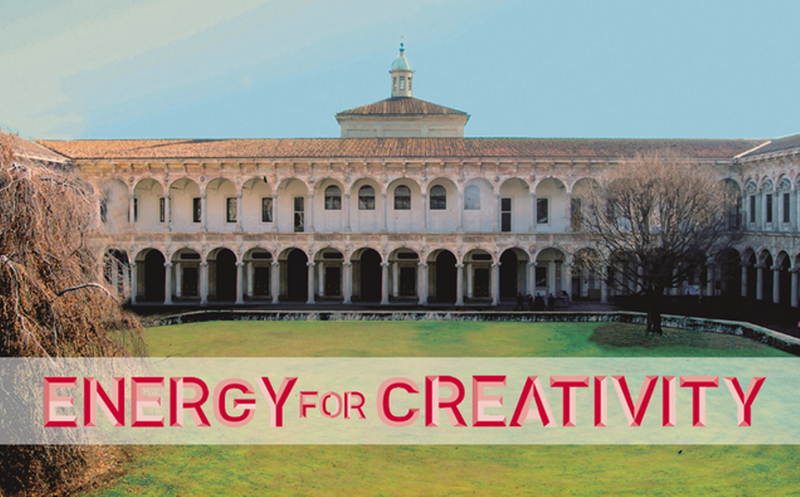 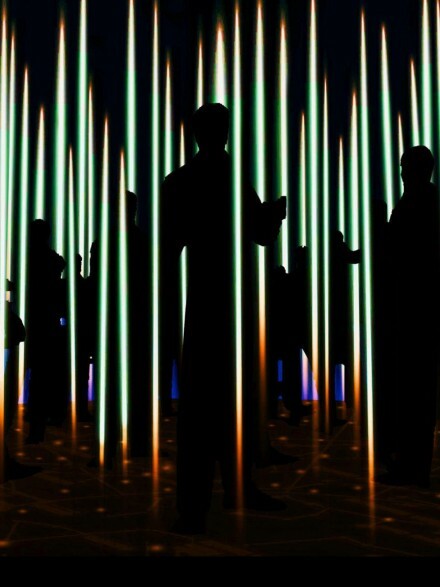 “Energy for Creativity” is closely linked with the topic of energy for life launched by EXPO2015 in order to reinforce a vocation for sustainability in the new millennium and to focus all the creative energy of designers and manufacturers on constructing spaces increasingly oriented towards individual and collective well being. 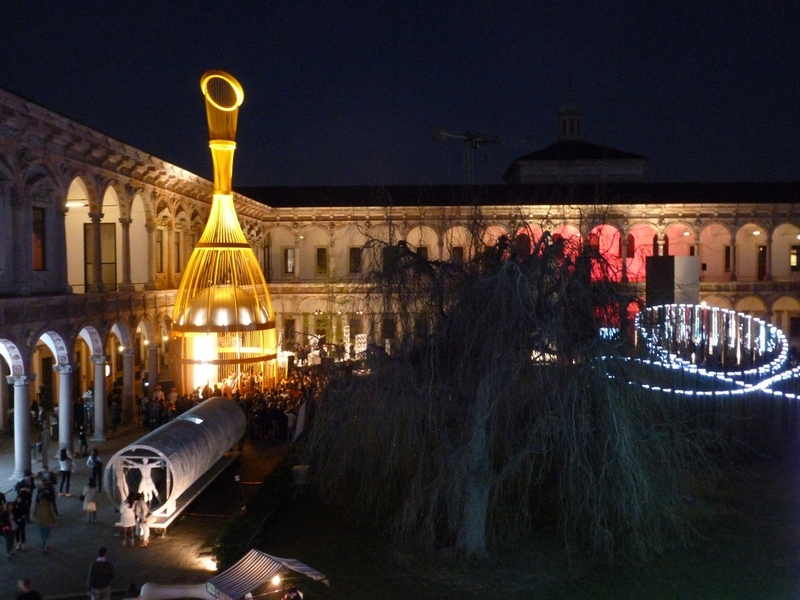 The Exhibition-Event is hosted once again in the courtyards of the main building of the University in Via Festa del Perdono, starting from the large Cortile d’Onore dominated, amongst others, by the mega installations of Luca Trazzi with French company Veuve Clicquot’s, Yellow Tower – a time capsule in the form of a champagne bottle that dialogues with Filarete’s arcade and the Torre Velasca in the background. 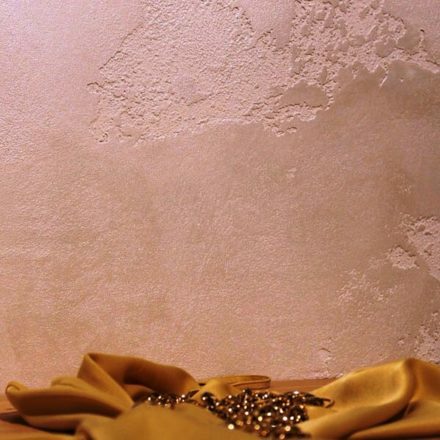 Yellow Tower has been inspired by the figure of Barbe-Nicole Ponsardin Clicquot, the ‘grande dame de la champagne’, entrepreneur ante litteram who created a brand of tradition from scratch. 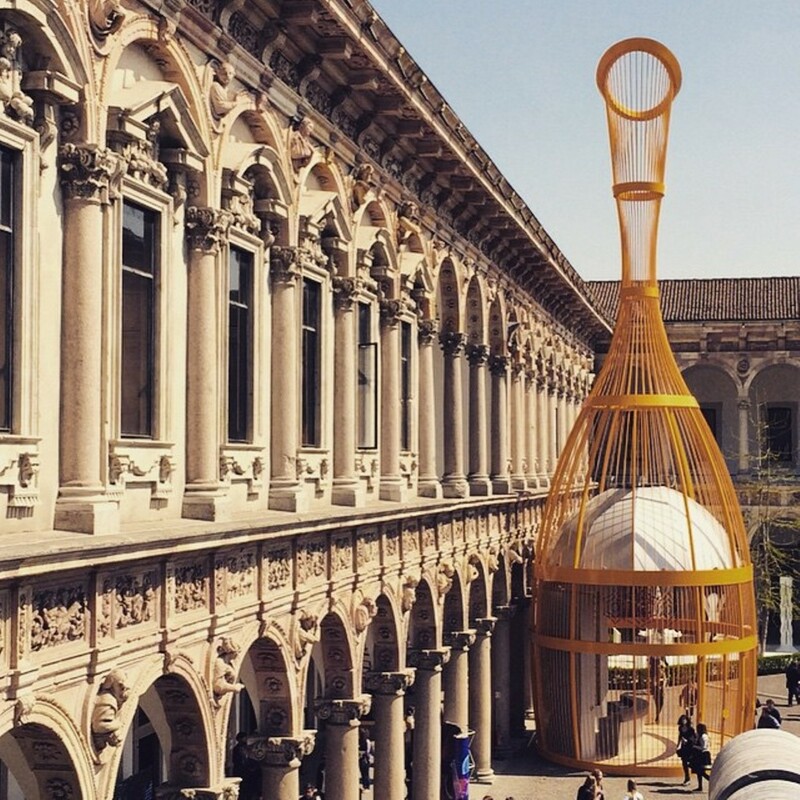 It is composed of calendared metal parts that reinvent the form of a champagne bottle; the structure with a height of 20 meters establishes a dialogue with the 17th-century portico of the Cortile d’Onore, where it is placed, and with the Torre Velasca seen on the horizon. 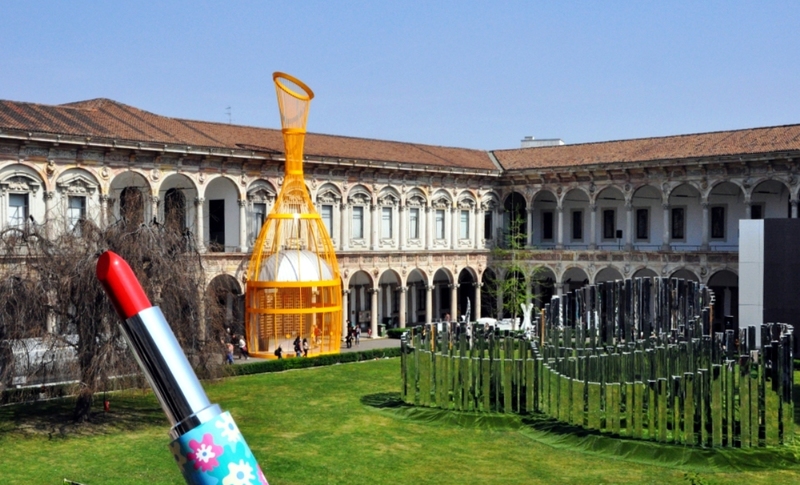 The architect and designer Luca Trazzi, with studios in Milan and Shanghai, has created a large yellow metal tower to celebrate the entrepreneurial spirit of Barbe-Nicole Ponsardin Clicquot. 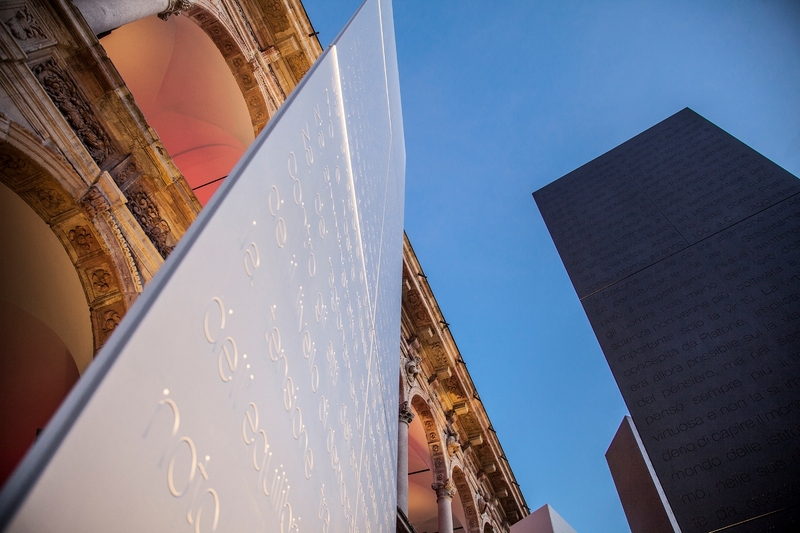 The Maison Veuve Clicquot, which produced the installation, was founded in 1772 in Reims and is still one of the leading producers of champagne. 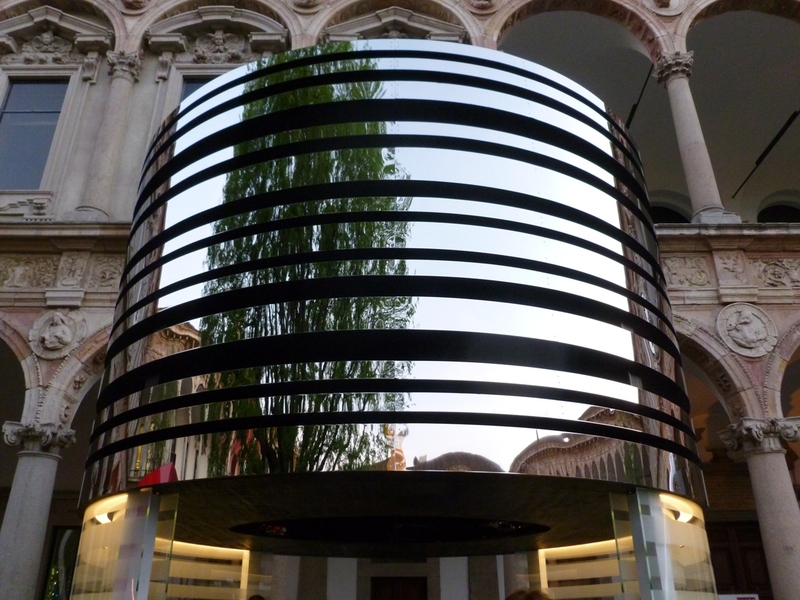 The architects Sergei Tchoban and Sergey Kuznetsov, together with Agniya Sterligova, have created the installation in reflecting glass at the center of the Cortile d’Onore, in collaboration with the Russian company Velko 2000, which designs, produces and installs building facades called Living Line. 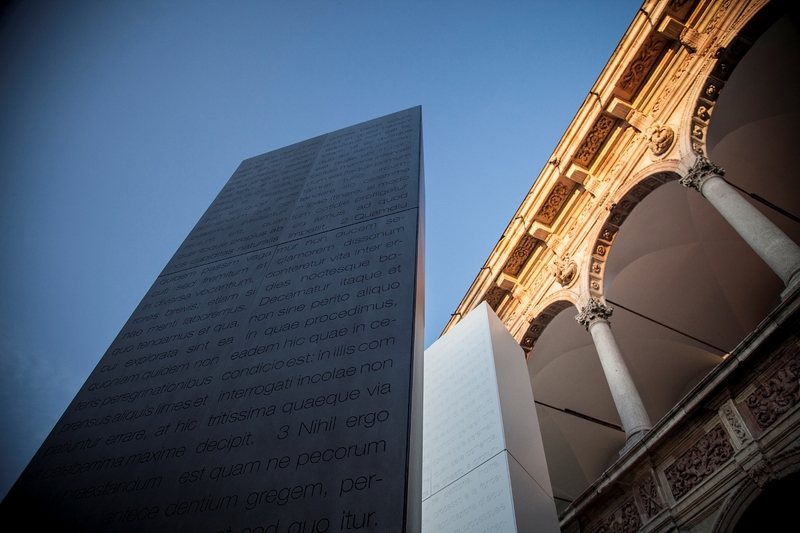 A ribbon of reflecting walls traces a design with rings, reflecting the historical portico: it symbolizes the perpetual motion of creativity that generates new visions of the world. 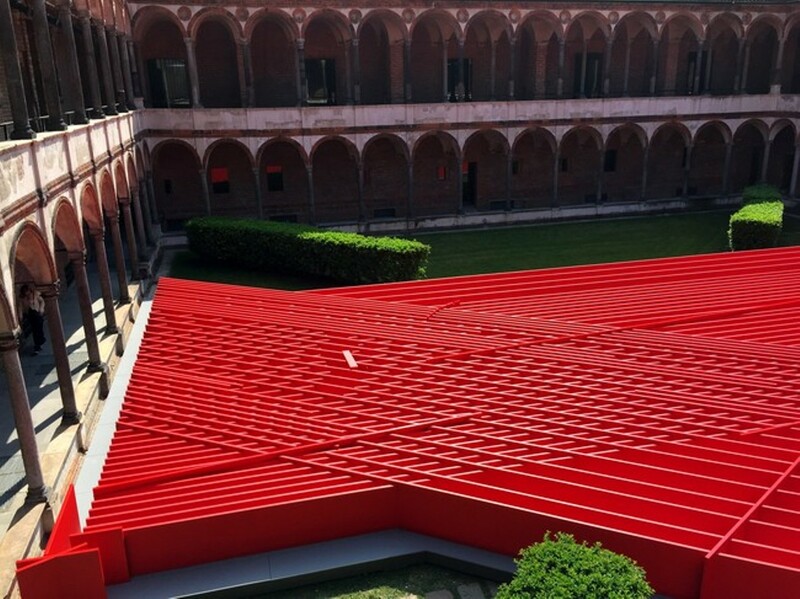 Living Line offers a creative mediation between reality and the viewer, triggering always new suggestions generated by different vantage points. 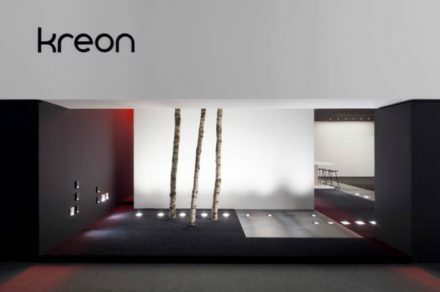 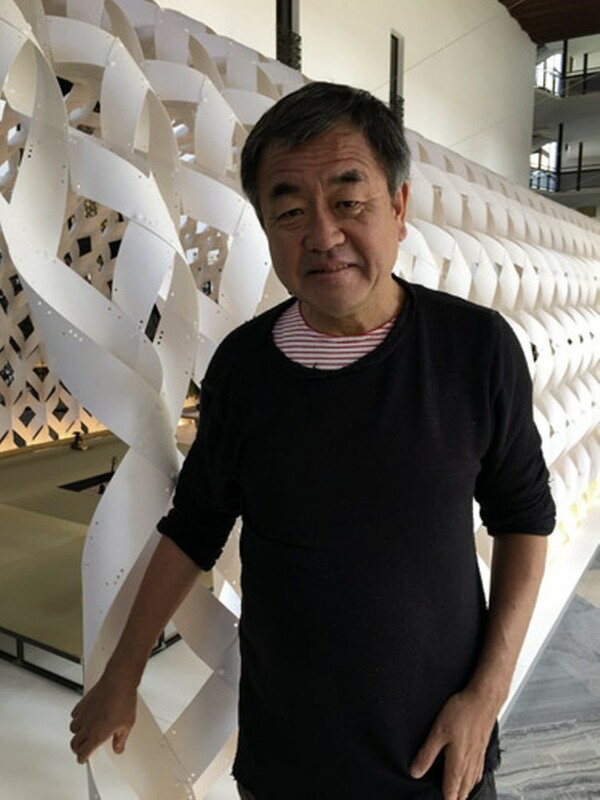 Tokyo and Paris-based architect Kengo Kuma also has an annual presence at the Salone. 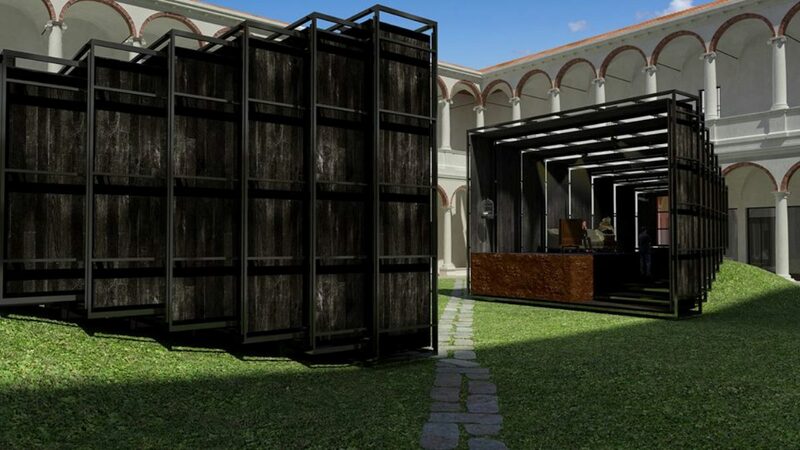 This year, he has created the installation Irori, in collaboration with the Japanese company TJM Design, which with the brand Kitchenhouse produces high-profile component kitchens distributed in Japan and China. 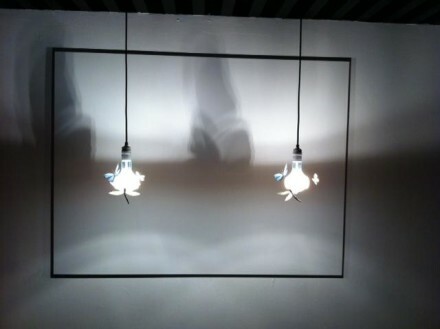 Based on the traditional Japanese hearth, or Irori, Kuma made what he refers to as fire and cocoon. 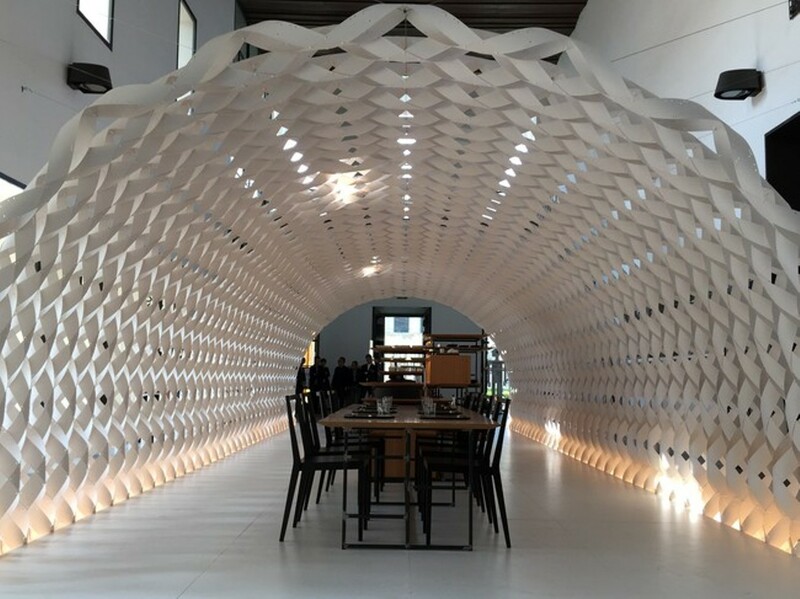 Made from 1mm-thick vulcanized paper, Kuma’s cocoon of twisting and weaving strips was developed on the computer but built by hand. 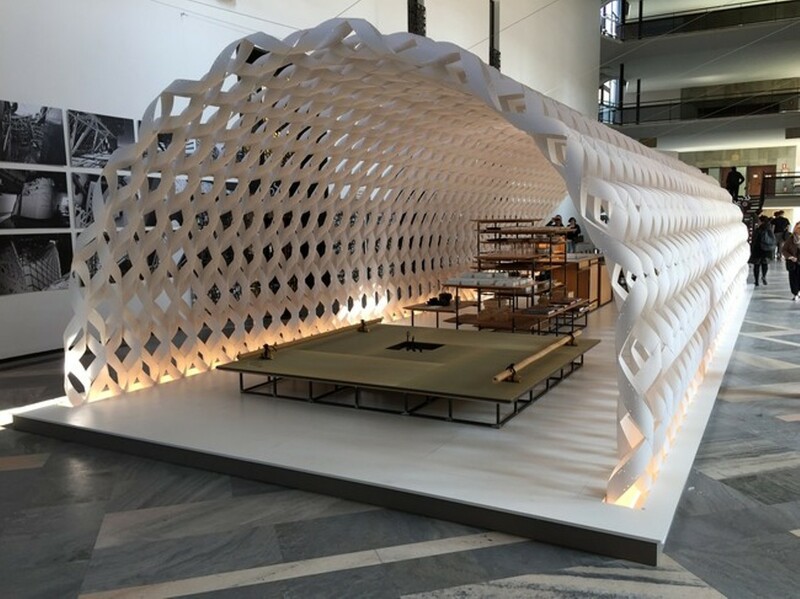 The long white, cloud-like structure, which supports itself, encases a space where a low fireplace, kitchen, and dining area flow into each other. 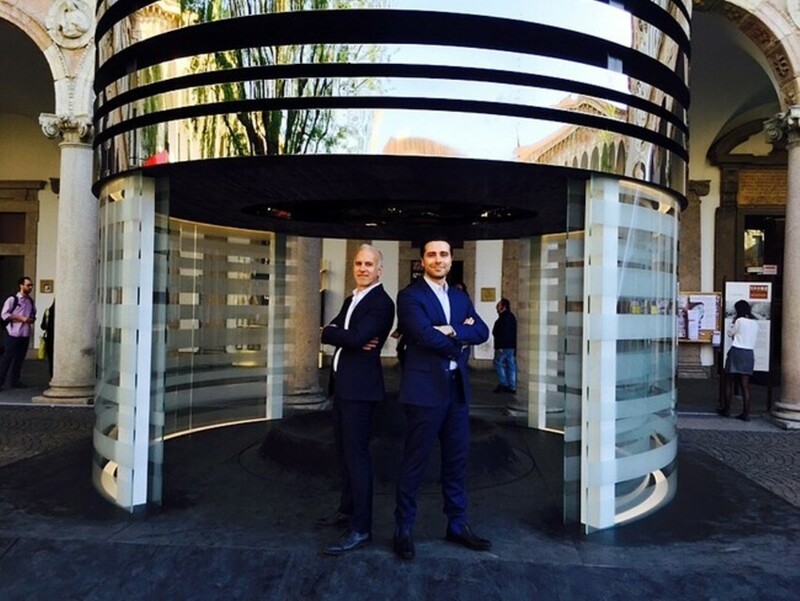 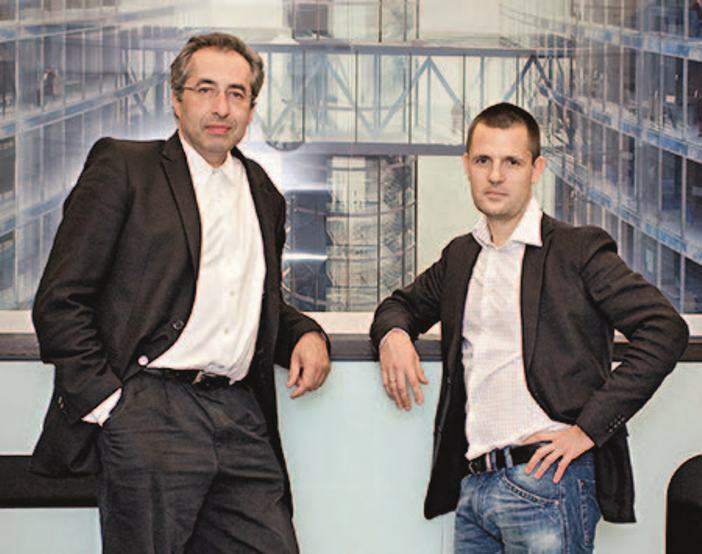 Exhibiting for the first time in Milan, New York-based architects Steve Blatz and Antonio Pio Saracino with Italian company Marzorati Ronchetti created Black Hole. 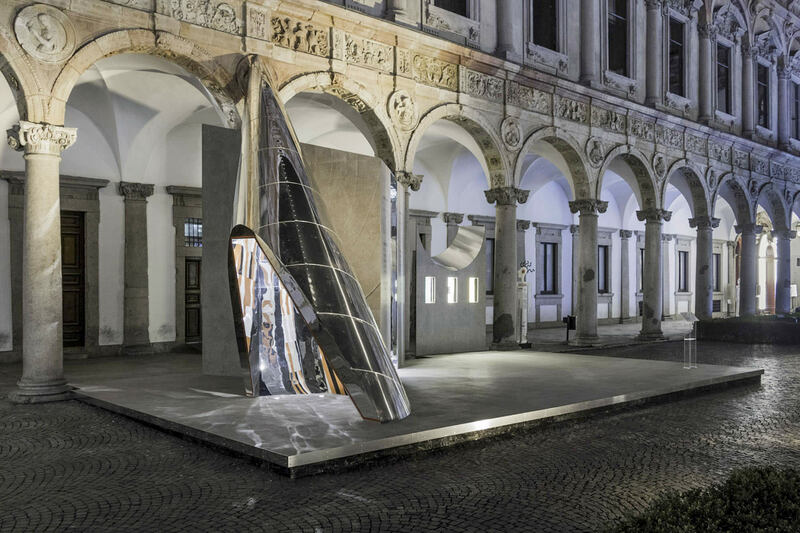 Composed of steel, glass, and wood their small tower is meant to be a creative balance of chaos and order, according to Blatz. 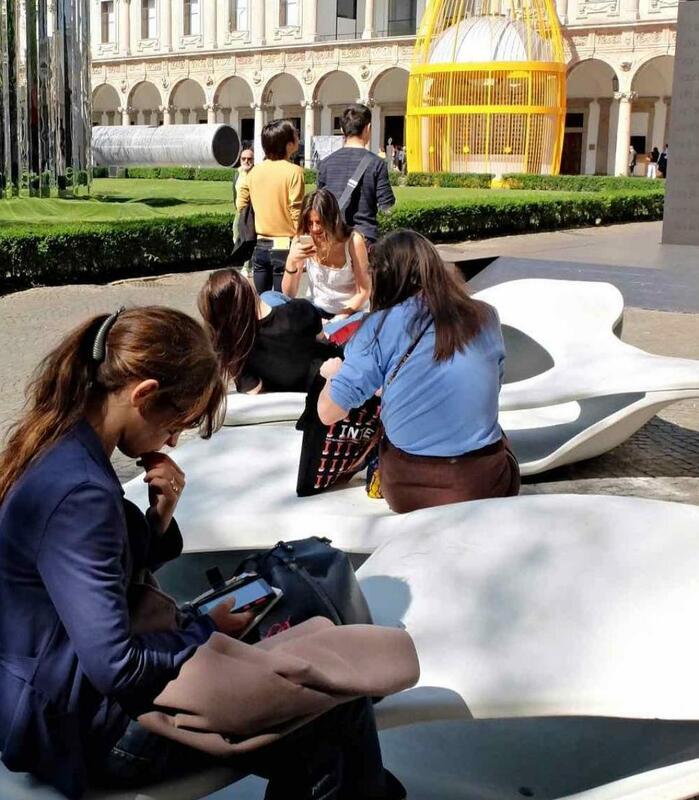 Within the perfectly round form, visitors can recline on the sinuous wood seating at the base to gaze up through the oculus, composed of irregularly-shaped, overlapping wood discs. 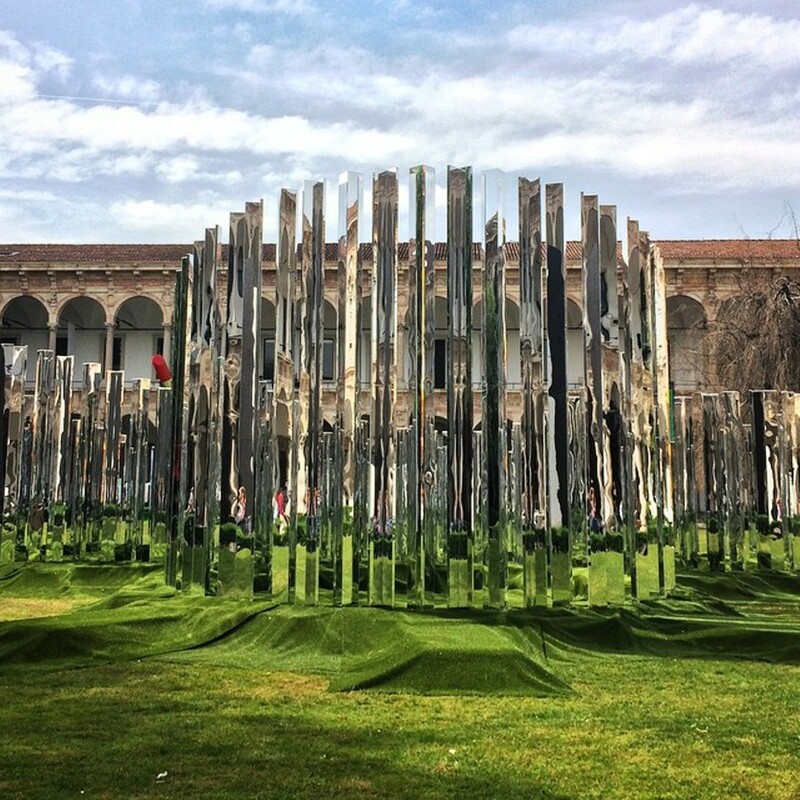 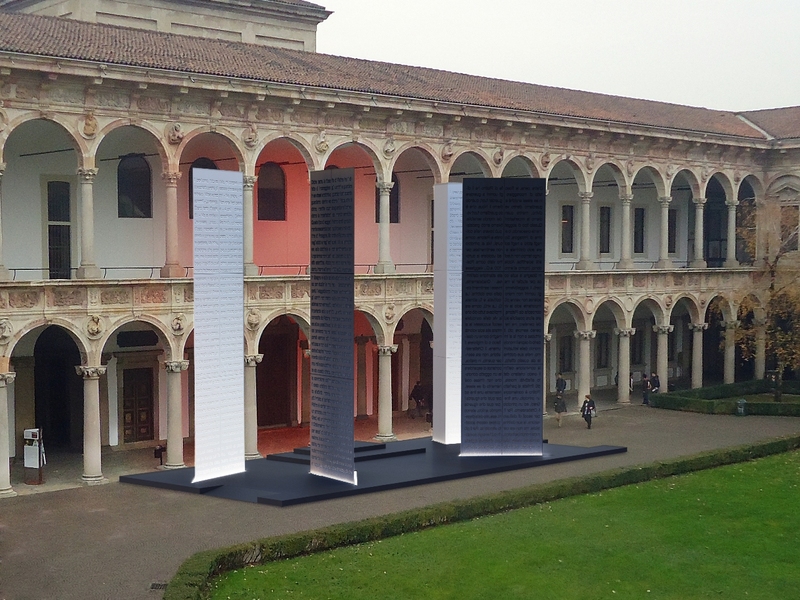 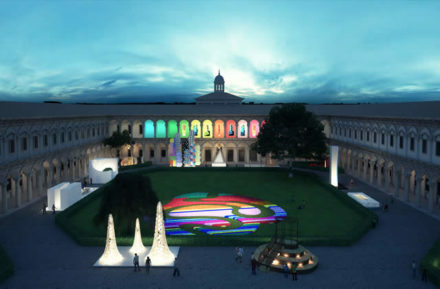 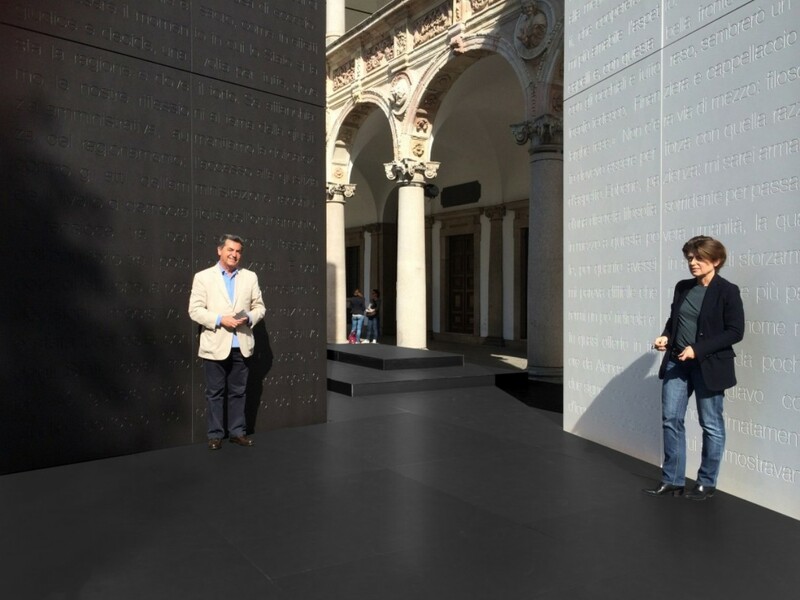 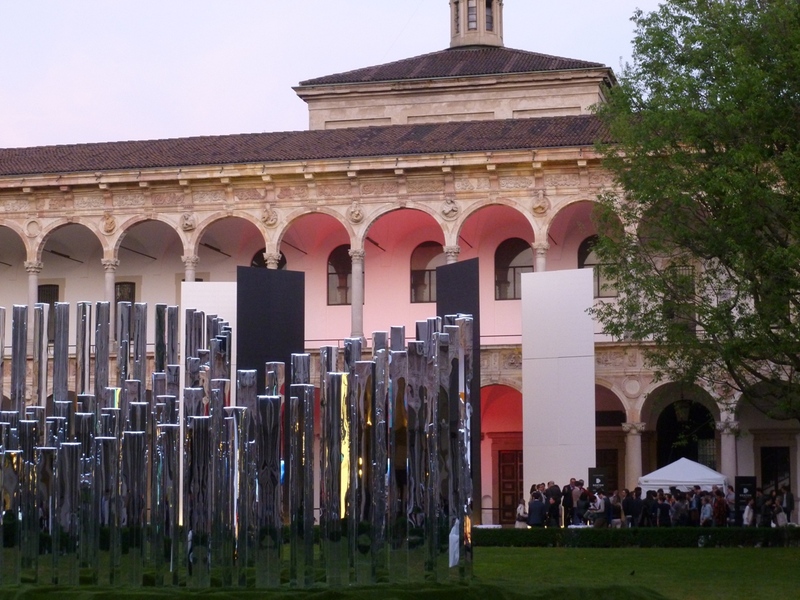 Deep Words Light created by Antonio Citterio and Patricia Viel in collaboration with Gruppo Cosentino was inspired by by the Teatro Olimpico of Palladio and stages, on a large platform, four tall steles (10 m) that form theatrical wings for the historic portico, interpreted as a set. 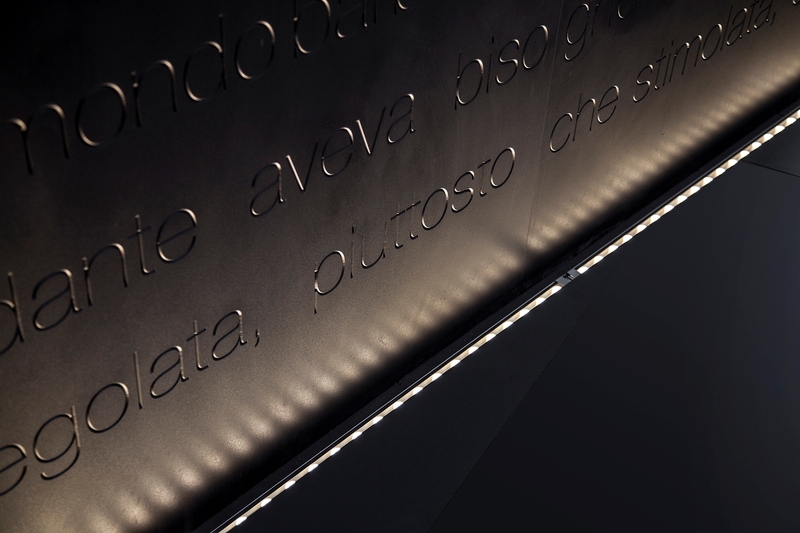 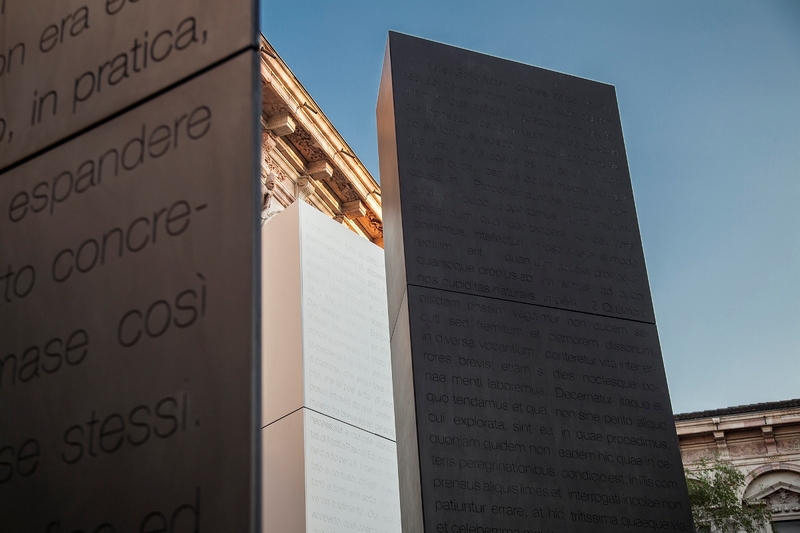 Each stele is composed of fifteen Dekton sheets, the new-generation facing produced by Gruppo Cosentino and characterized by great strength, on which water-jet technology has been used to engrave the texts, enhanced by oblique lighting. 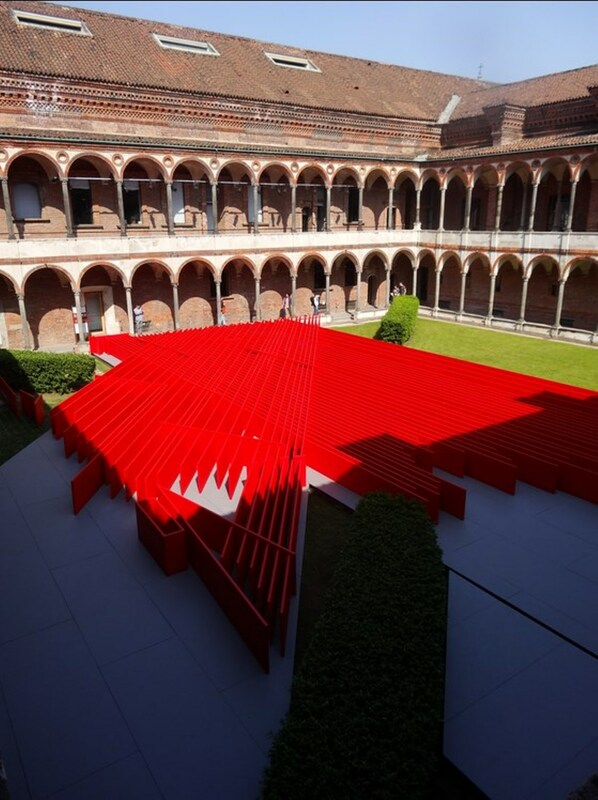 Antonio Citterio and Patricia Viel architecture studio founded in Milan in 1999 operating on an international scale on complex design programs; they have created the installation in the Cortile d’Onore with Gruppo Cosentino, a Spanish company that produces innovative surfaces for architecture and design on a global level. 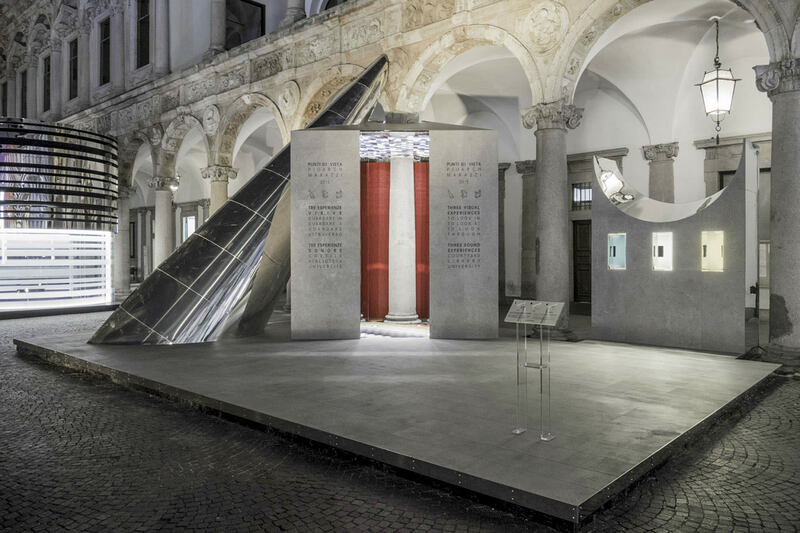 Facing each other in the Cortile del 700, the two pavilions of the installation Camera Chiara, by the Franco-Lebanese architect Annabel Kassar create an original parallelism situation with respect to the regular vaults of the Baroque double portico. 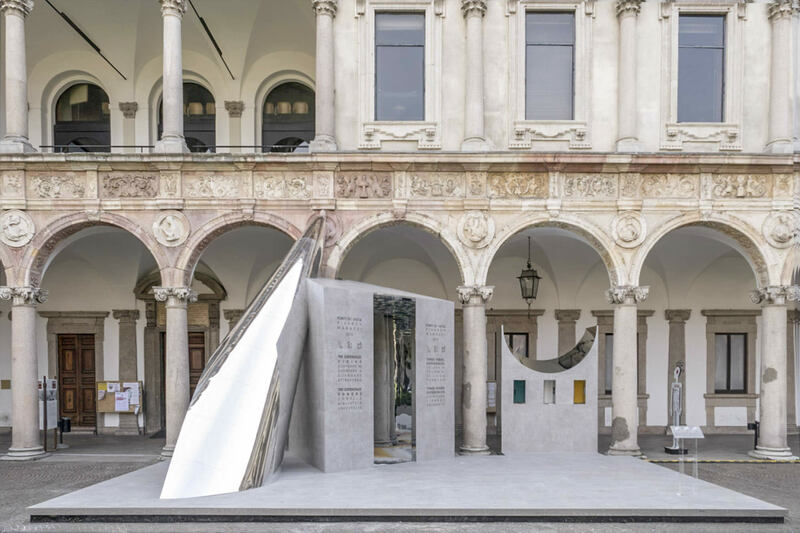 Composed of a telescopic stepped structure in steel and wood, the pavilions invite visitors to enter for a firsthand experience of domestic life, echoing with faraway music and unexpected imagery. 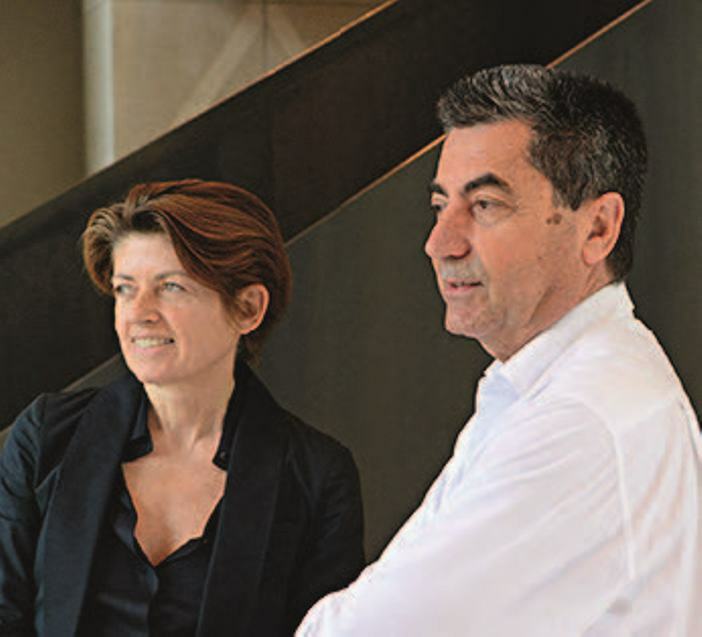 Architects and Interiors From Paris to Lebanon, the architect Annabel Kassar has founded a studio with offices in Beirut, Dubai and London. 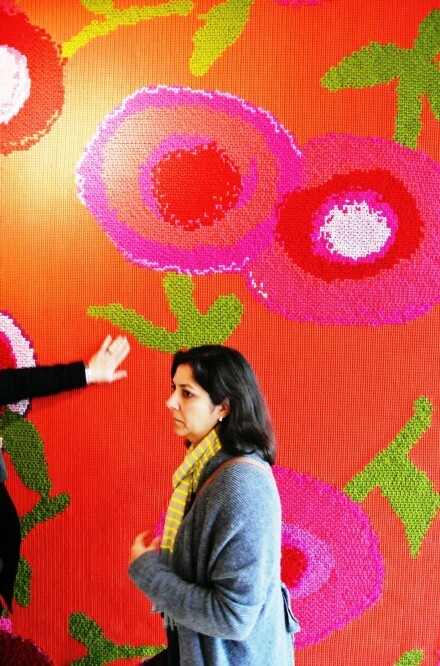 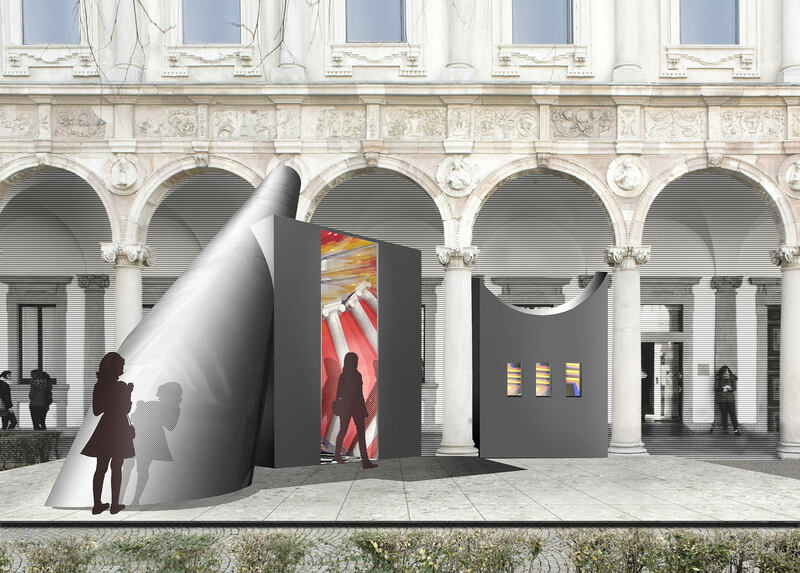 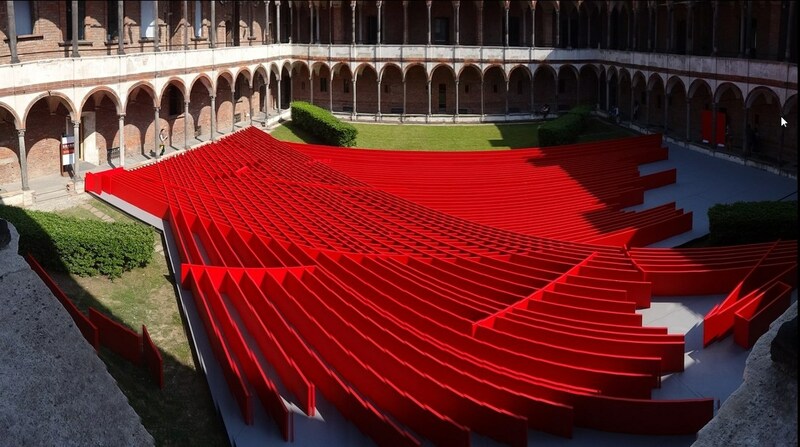 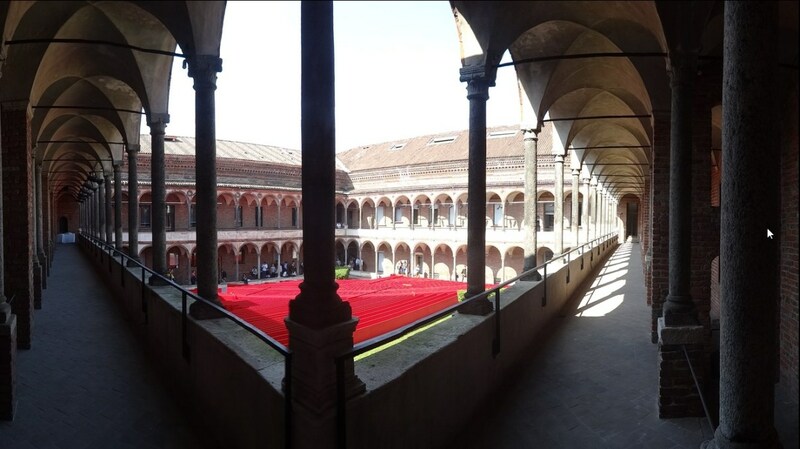 With the HSC, she has designed the installation Camera Chiara, with two furnished pavilions open to visitors. 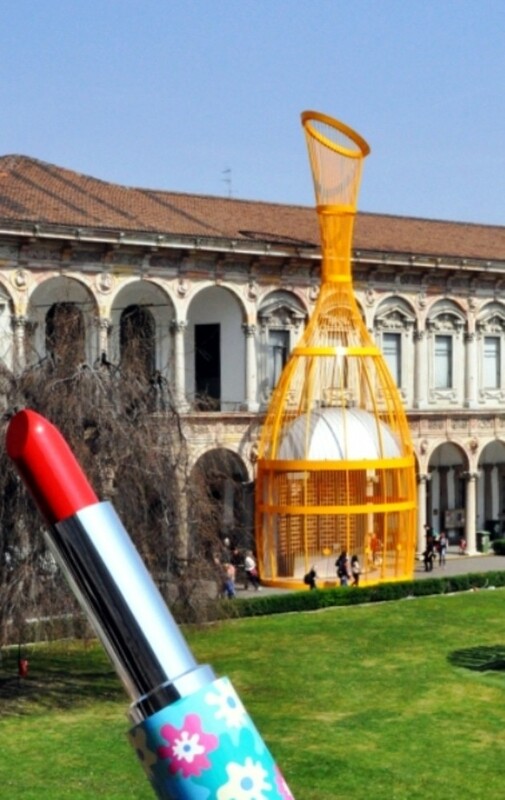 The ways to express ‘the energies of a positive and creative life’, according to Alessandro and Francesco Mendini, ‘are infinite’: one of them is a small, colorful, playful and gentle object, which makes every woman the artist of herself on a daily basis: lipstick. 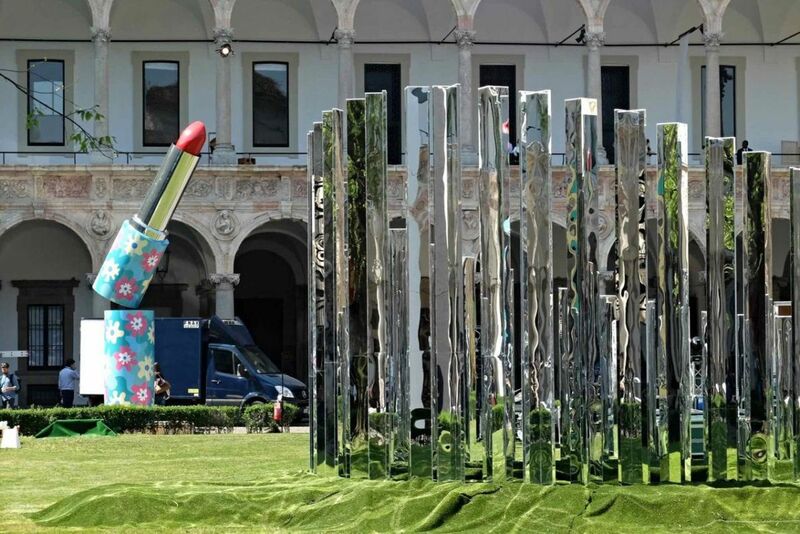 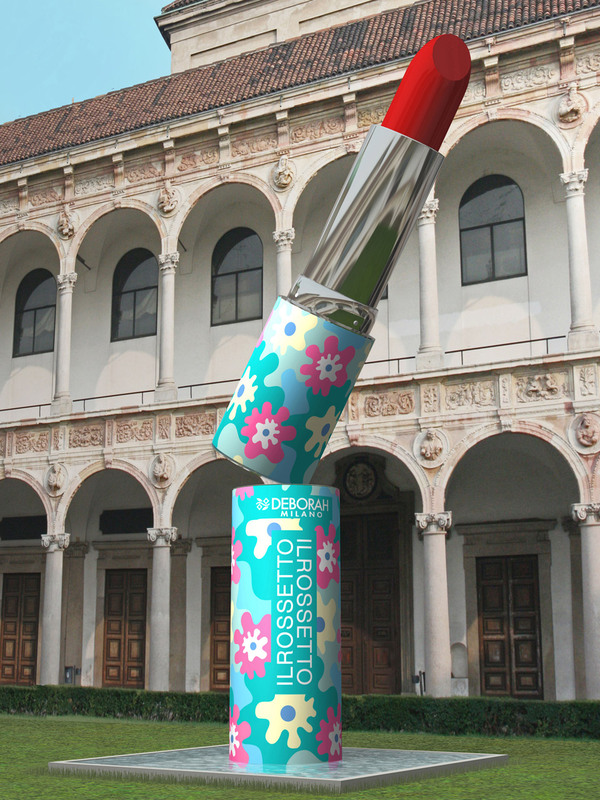 The Mendini brothers pay sculptural homage to this object, creating a divertissement on a monumental scale: a large steel lipstick that stands in the cortile d’onore, composed of two cylinders of over one meter in diameter covered with a colored film. 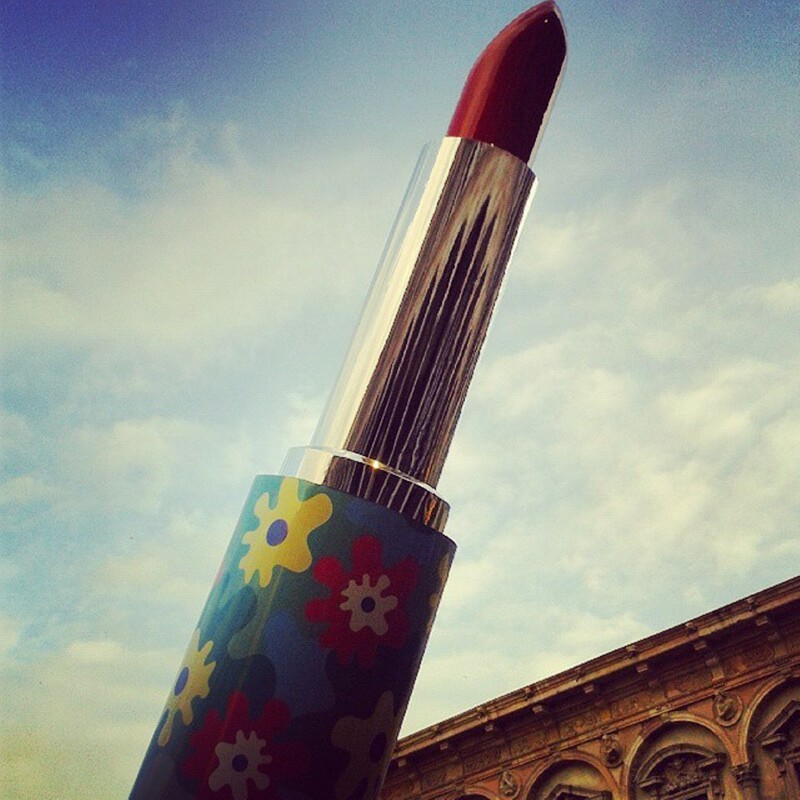 The opposite rotational movement of the two cylinders makes the lipstick emerge from its container. 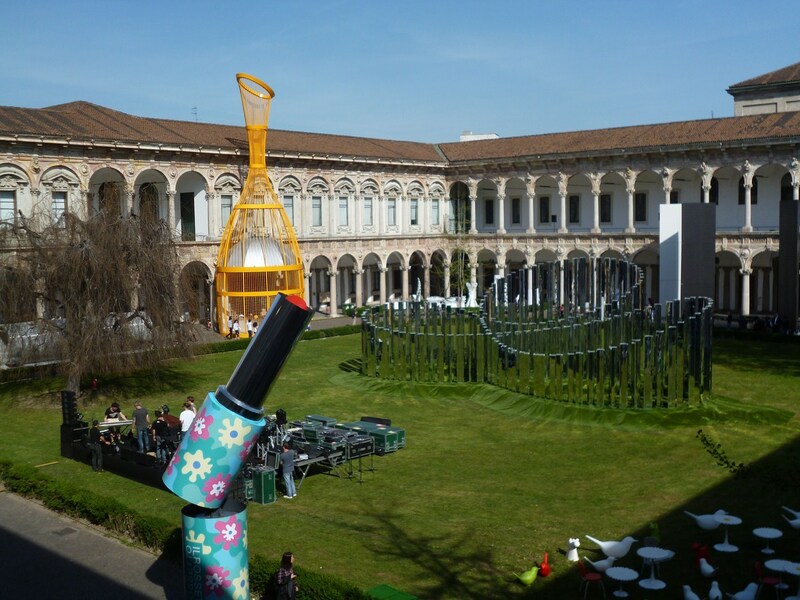 The round form is a tribute to il rossetto, the bestselling product by Deborah Milano, which has collaborated to make the sculpture by the Mendini brothers. 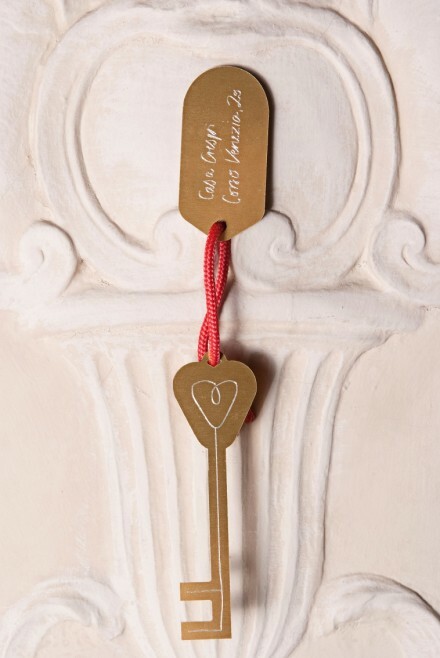 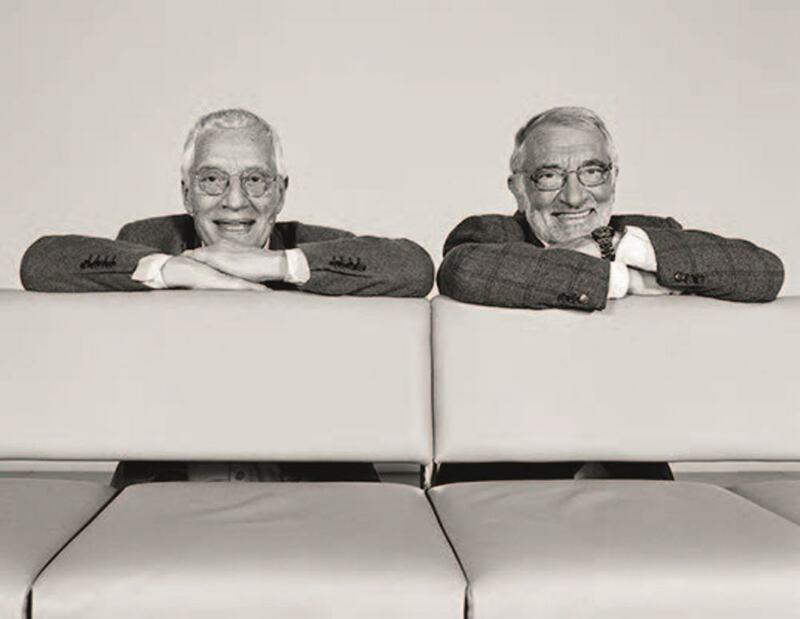 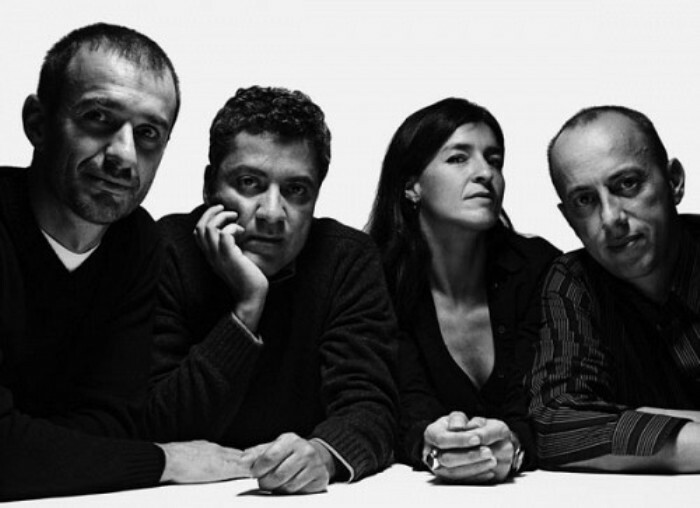 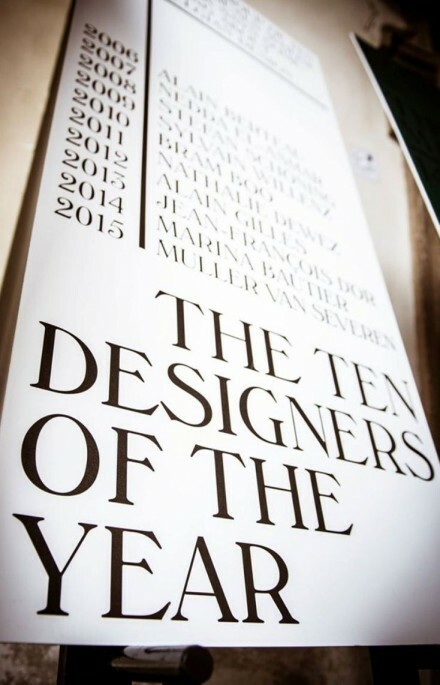 The Medini brothers have worked together since 1989, the year of the founding of Atelier Mendini. 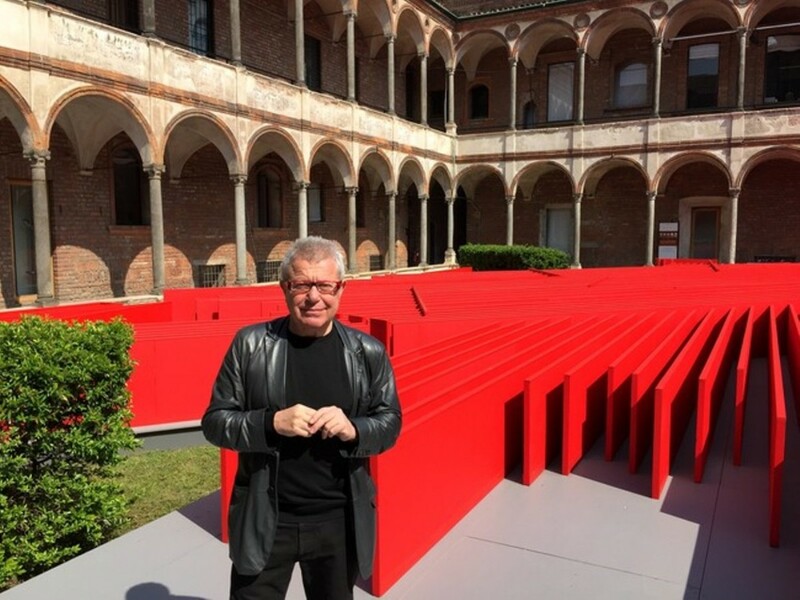 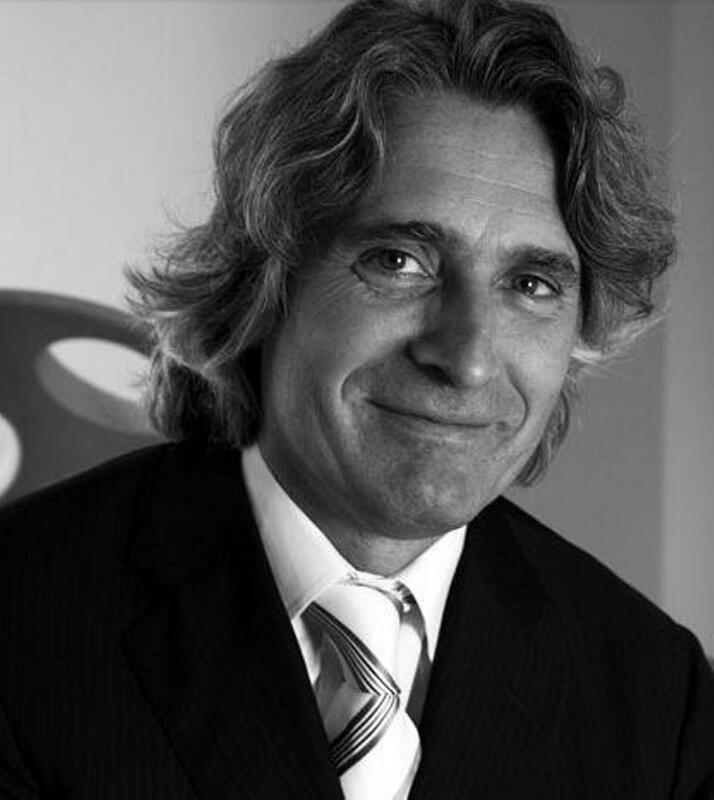 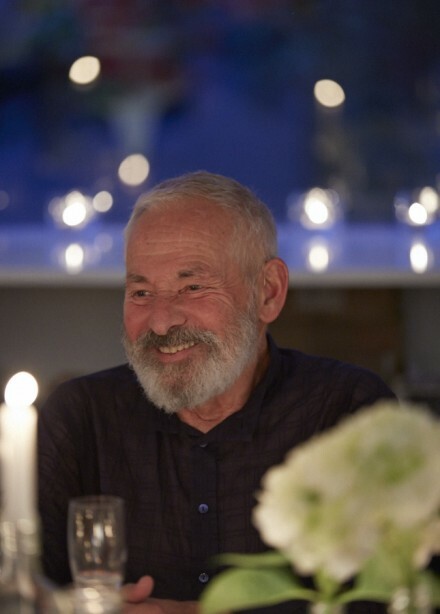 Alessandro, who has written the theoretical manifesto of Energy for Creativity, recently received the European Prize for Architecture 2014. 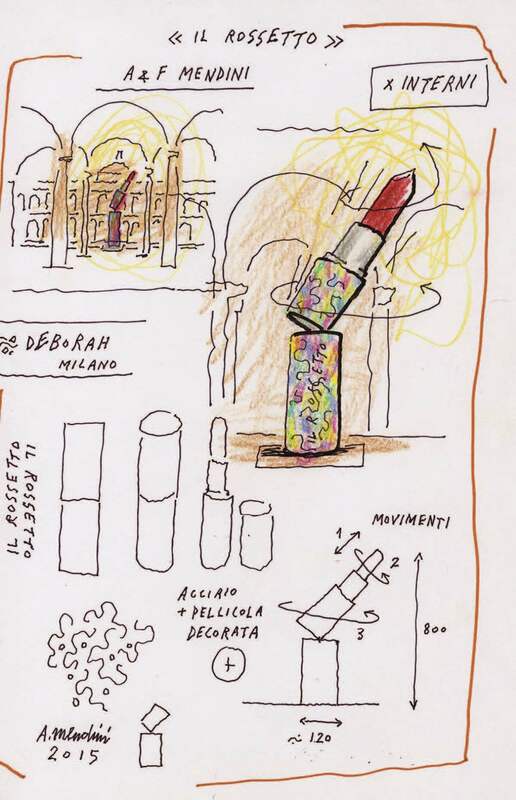 Monumento a IL ROSSETTO has been produced with Deborah Milano. 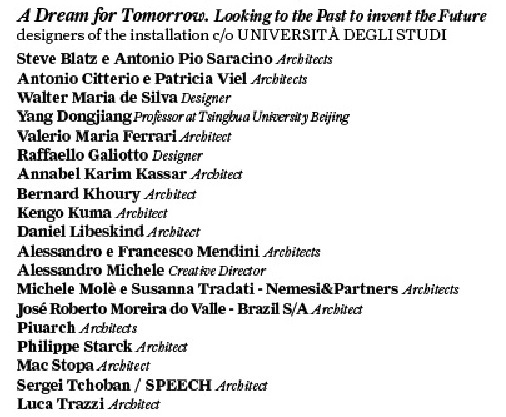 Piuarch goes to the origin of architectural archetypes of Ca’ Granda, to build an installation that aims to stimulate a reflection on the architectural features of the context. 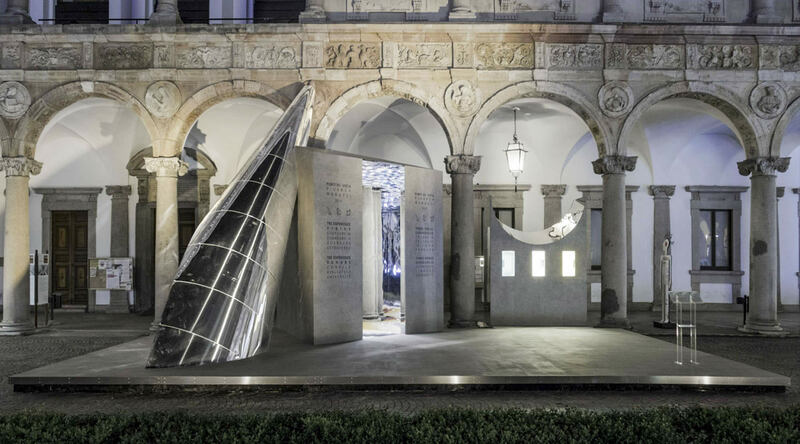 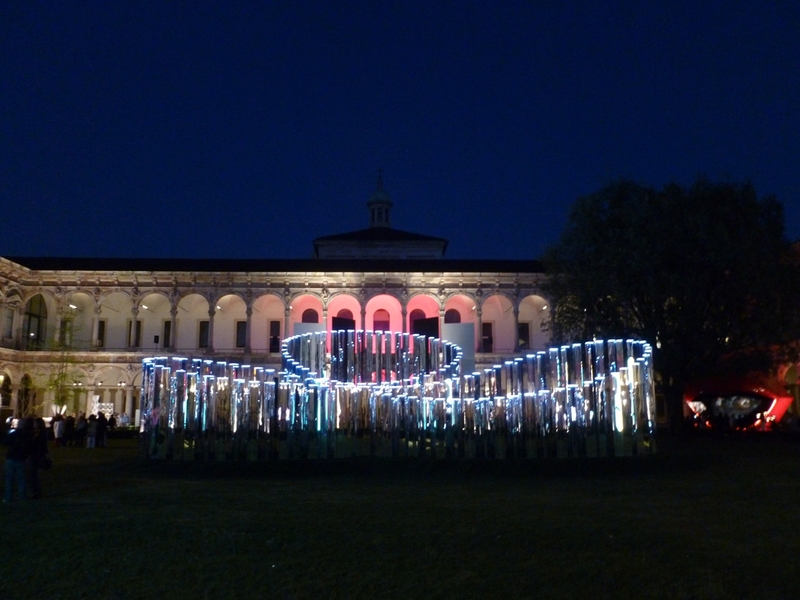 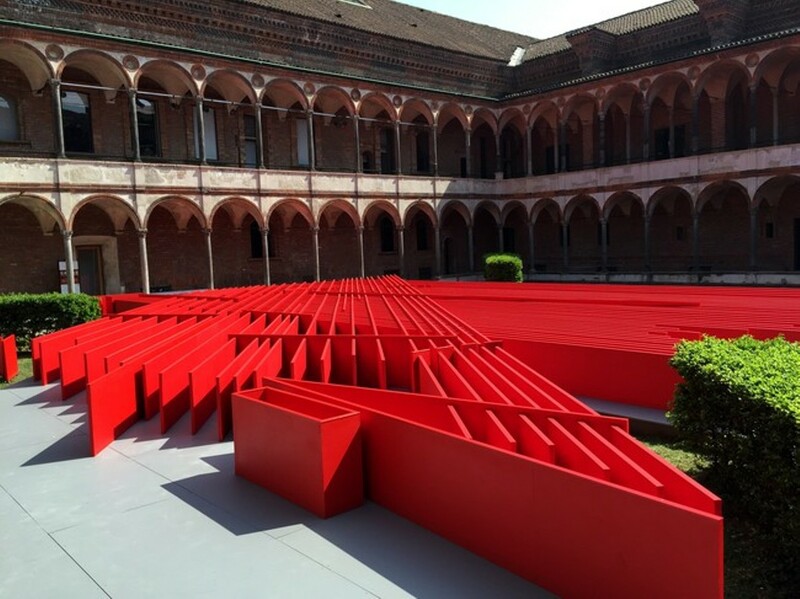 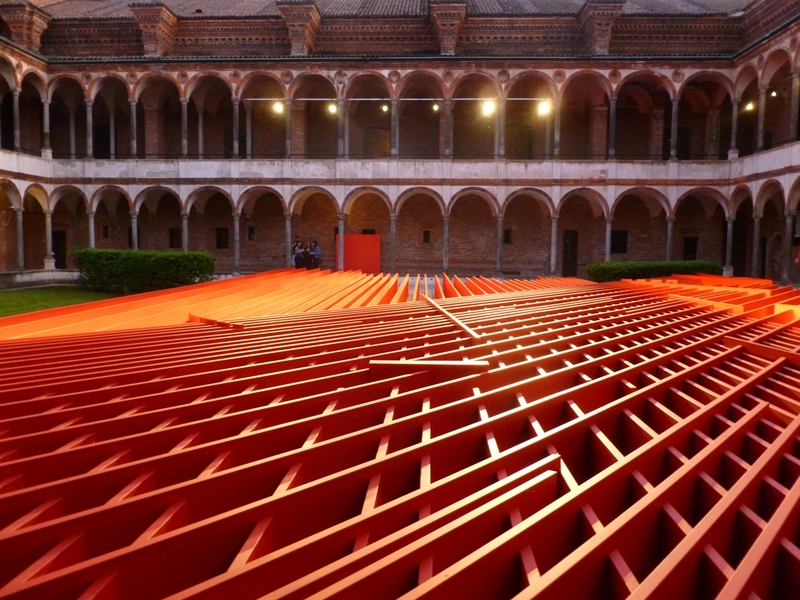 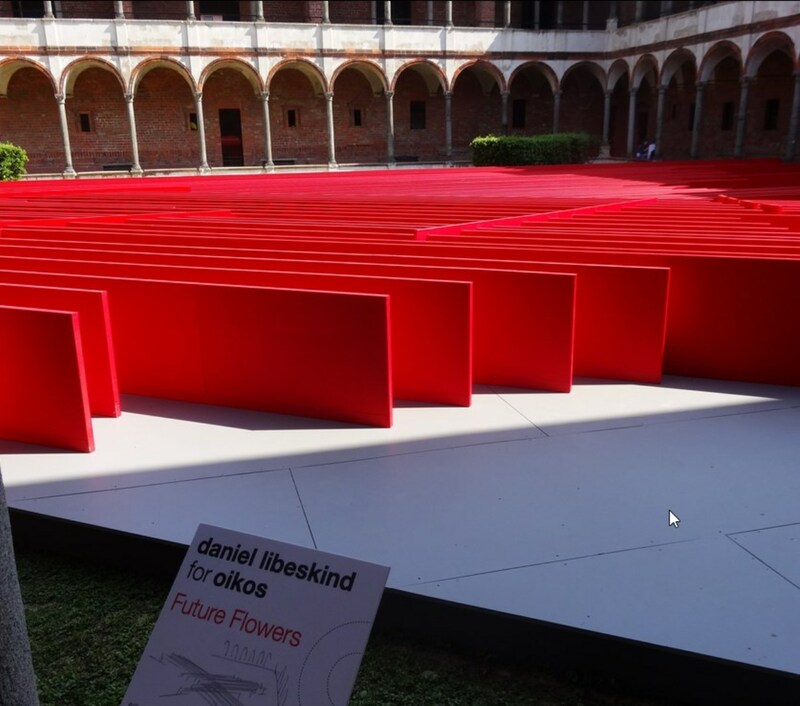 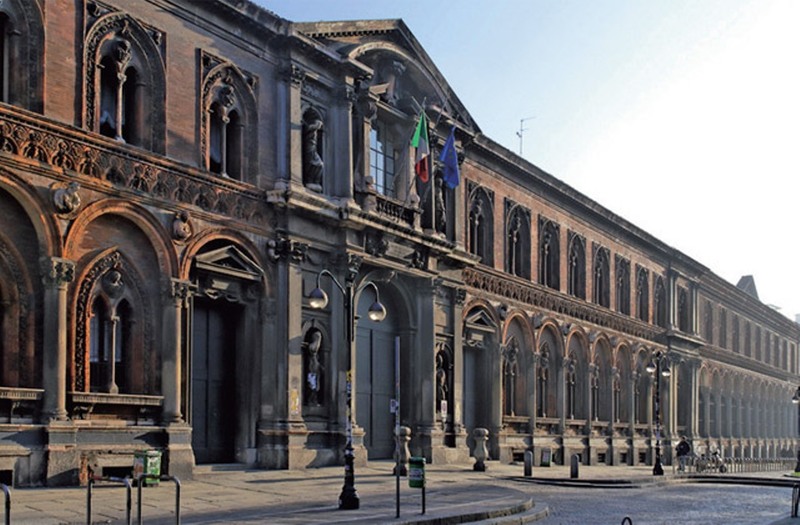 The classic elements of the architecture of the Statale University – the frieze, the column and the arch – are broken into pure geometric figures, from these shapes arises an interactive volume. 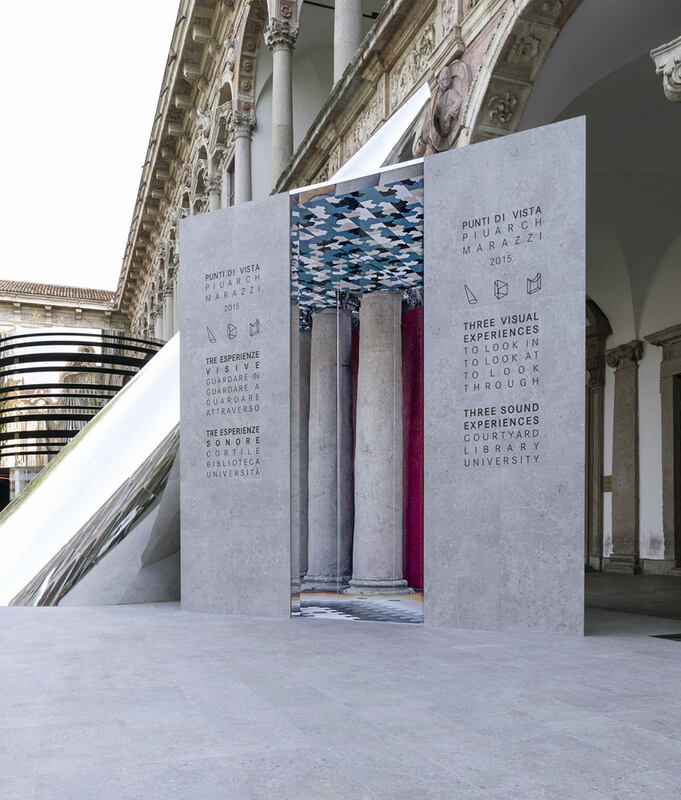 The three architectural forms, covered with grès Mystone Marazzi, offer multiple visions look ‘in’, look ‘to’ and look ‘through’: guests, approaching and entering the structures, can live experiences of reflection and vision, totally immersive or kaleidoscopic games.